One of the worst kinds of skin problems is breakouts and zits that erupt on your face. They are red, bumpy and painful. To top it all off, they look unsightly. The hair follicles, or pores, in your skin contain sebaceous glands that produce oil which lubricates the hair and skin. 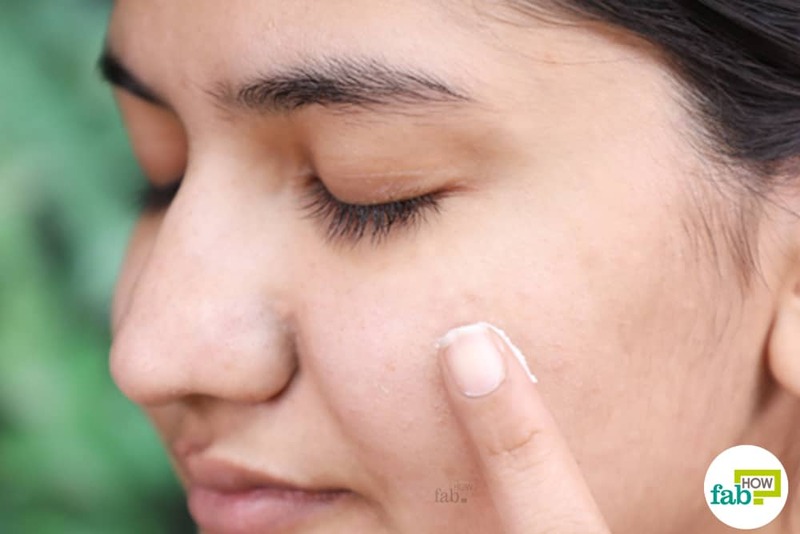 Acne breakouts occur when dead skin cells and oil from the sebaceous glands clog the hair follicles causing bacteria to become trapped thus starting the beginning of an acne breakout. Acne is the most common skin condition, affecting millions of people worldwide. It can occur anywhere from your face, shoulders, back and neck to your chest and upper arms. It is not something to be afraid of but left untreated it can leave nasty scars on the skin. There are several factors that can cause acne. Oily skin: When glands in your skin produce excess oil (sebum), it accumulates and clogs the pores, which causes acne. Friction on the skin: Skin repeatedly rubbing against something like a helmet, tight collar, cell phone or backpack can lead to acne. Food: High glycemic foods and dairy products have shown to trigger an acne breakout. Stress: Stress does not directly cause acne, but it can contribute to it and exacerbate a breakout. Certain medications: Some medications like drugs containing iodides, bromides or steroids might worsen flare-ups. Pollution: The constant exposure to pollutants in our environment accumulates dirt on skin pores which results in acne. Do a patch test before using any of these remedies to check for an adverse reaction. A safe place to test for an allergic reaction is on the skin behind your ear. Depending on your skin’s sensitivity you should wait for 24-72 hrs before deciding to use the product. Essential oils are highly potent plant extracts. Do not use remedies that contain oils on pregnant women, infants, and young children without a physicians approval. Always use essential oils in diluted form. Do not use them directly on the skin. Severe flare-ups can be a sign of an underlying problem. Consider scheduling an appointment with a dermatologist to discuss your options. 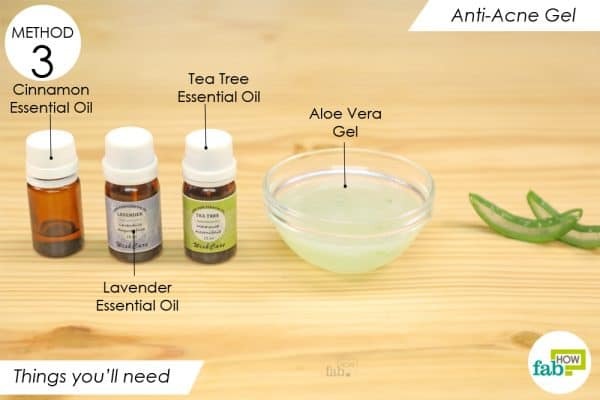 Here are a few homemade anti-acne cream and gel recipes that you can prepare using common household ingredients to help you treat acne and acne scars. This homemade anti-acne cream uses the potent lavender, tea tree and rosehip seed essential oils that help treat acne breakouts. Along with reducing an acne breakout, lavender essential oil functions as a nerve-calming and soothing agent. It is also known for healing scars or wounds. The tea tree oil has antibacterial and antifungal properties — this aids in killing the acne-causing bacteria. Rosehip seed oil contains vitamin A commonly known as retinol which fights acne, and linoleic acid which heals acne. It also improves the skin’s texture and reduces hyperpigmentation. The anti-aging properties of rosehip seed oil also work on the fine lines, wrinkles and increase the skin's elasticity. This recipe also contains shea butter, which is known for its healing properties. It deeply moisturizes the skin and prevents dry skin. The moisturizers in shea butter imitate the moisturizing agents in sebum. Thus, your skin is tricked into thinking that it has enough sebum and stops the excess production of the natural oil. Shea butter is also noncomedogenic in nature, which means it won’t clog the pores. Vitamin C in the recipe helps in the production of collagen, which supports healthy growth and repair of skin tissue to help reduce acne scars and even hyperpigmentation. 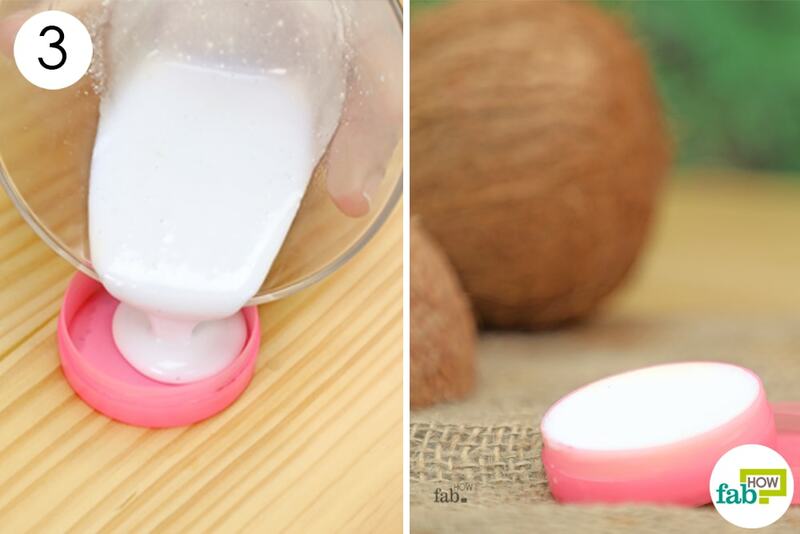 Put ¼ cup of shea butter in the glass bowl and let it melt. Remove it from the heat and let the mixture cool off a bit. 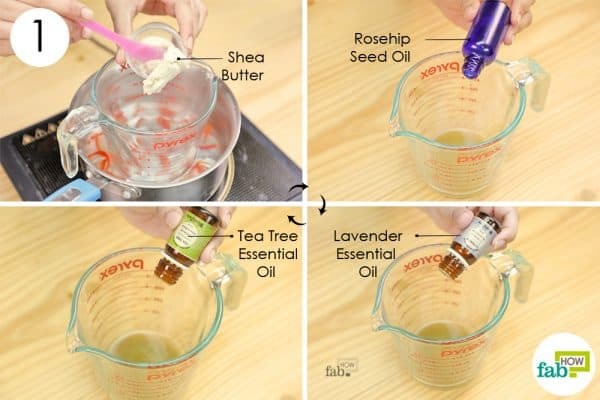 Add 2 tablespoons of rosehip seed oil, followed by 6 drops each of lavender and tea tree essential oils. Add 1 tablespoon of vitamin C powder. Whisk the mixture with a motorized hand mixer to blend all the ingredients well. 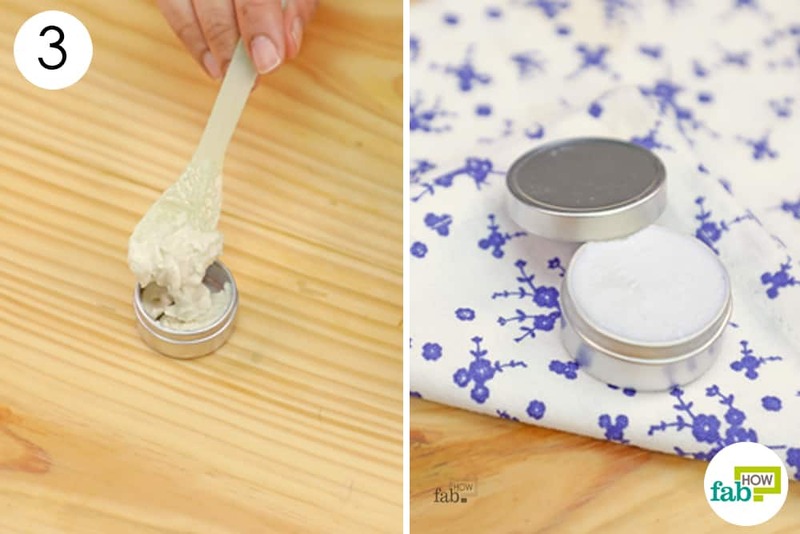 Transfer the whipped contents into a reusable and airtight container. You can use it right away or refrigerate it overnight to let it harden a little bit. Do not put it in the freezer. Wash and pat your face dry before each use. Apply the cream to the affected area or your entire face before bedtime. 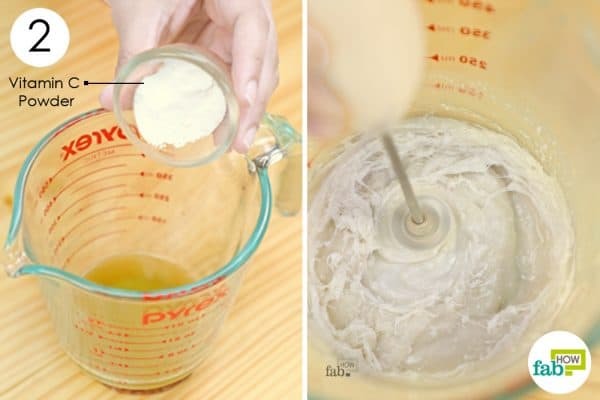 You can apply this homemade anti-acne cream up to 3 times a day to treat acne. The cream will stay good for up to 1 month when stored in a cool, dark place. 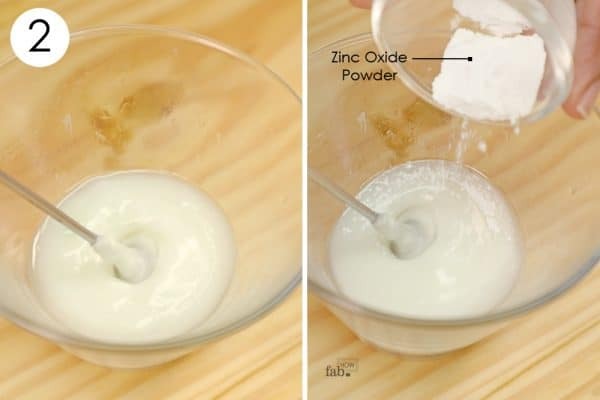 This cream uses zinc oxide powder, which is used in most diaper rash creams. For acne, it helps dry out excess oil production, soothes the inflammation and redness, and decreases the size of breakouts and pimples. 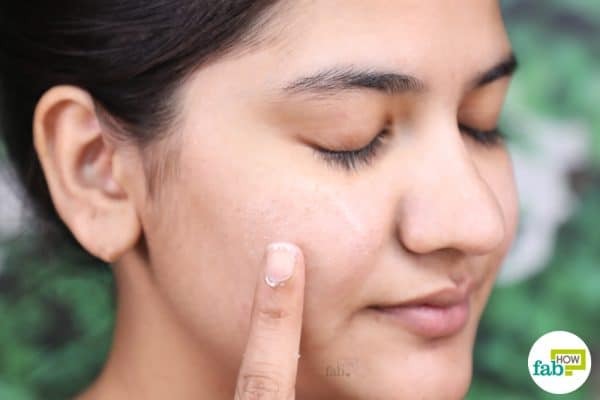 When combined with other acne-fighting ingredients, zinc oxide shields the skin from environmental irritants, aiding the other elements in removing the acne-causing bacteria. Aloe vera with numerous benefits for face and skin; is also known for its potent healing properties. It contains magnesium lactate, which helps reduce the itching caused by pimples or breakouts. It also contains saponins, which eliminate the acne-causing bacteria and other organisms. 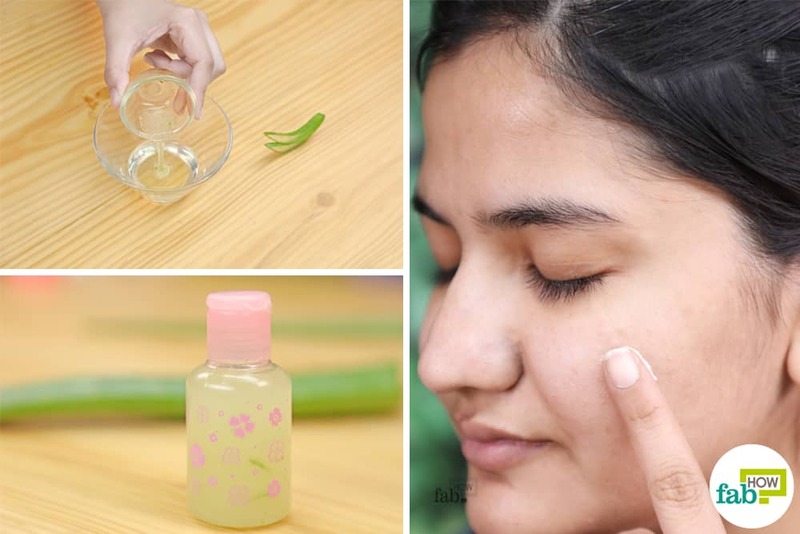 The salicylic acid present in aloe vera helps unclog the pores and restores the pH balance of the skin. It also acts as an astringent, which eliminates excess oil and dirt, reducing the frequency of breakouts on the skin. Tea tree oil used in the cream cleanses the skin of any fungal infections. Coconut oil also has antibacterial and antifungal properties. It also contains lauric acid, which is a highly moisturizing agent for the skin that won’t clog the pores. Add ½ teaspoon of freshly extracted aloe vera gel to it. You can extract fresh aloe vera gel at home with a few simple steps. Add 3 or 4 drops of tea tree essential oil to the mix. Blend the ingredients using an electric whisker. Add ½ teaspoon of zinc oxide powder while continuing to whisk all the ingredients together. Pour the cream into an airtight container. Refrigerate it to let the cream solidify or use it as is. Do not put it in the freezer. Apply the homemade anti-acne cream as the last thing you use on your face before going to bed. The next morning, wash your face as usual. You can use the anti-acne cream each night or twice a day if needed. The cream will last for 2 to 3 weeks when stored in a cool and dark place. Aloe vera gel possesses antibacterial properties that are highly effective in treating acne. 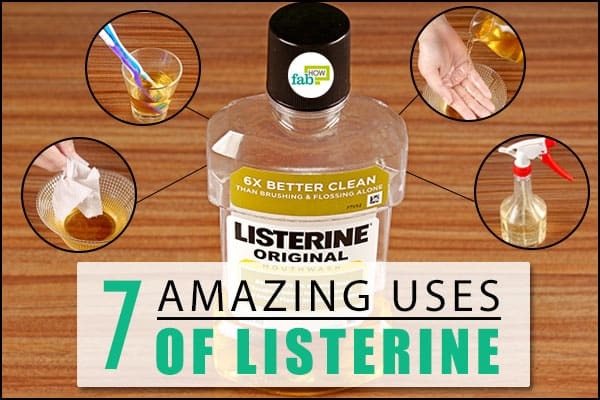 It also prevents the bacteria from spreading and accelerates the healing process. Its anti-inflammatory properties will soothe the skin and help it heal. Lavender mixes well with tea tree essential oil, fast-tracking the healing process of damaged skin. Lavender oil also has astringent properties that clear the impurities out of the pores and rejuvenates the skin, without causing excessive dryness. Tea tree oil has antimicrobial and anti-inflammatory properties that help treat acne and aid in the prevention of future breakouts. The cinnamon essential oil contains eugenol that possesses considerable antibacterial and antioxidant activity that fights off acne-causing bacteria. 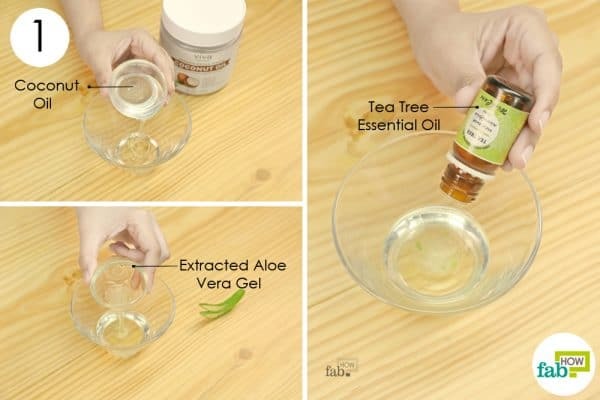 Put a 1/4th cup of aloe vera gel in a bowl. Add 10 drops of lavender essential oil, 5 drops of tea tree essential oil and 1 or 2 drops of cinnamon essential oil to the aloe vera gel. 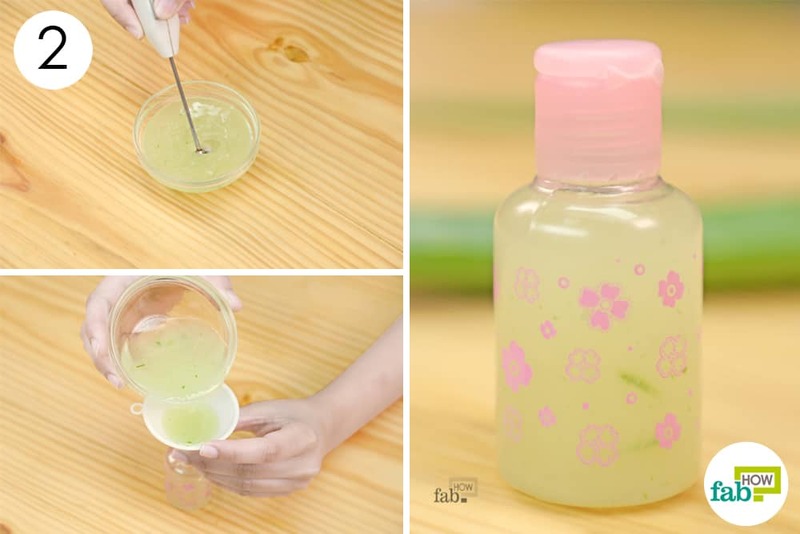 Blend the mixture using an electric hand whisker, and transfer the product to an easy-pour bottle using a funnel. Soak a washcloth in hot water for 2 to 3 minutes, then wring out the excess water. Wash your face, then place the hot towel on your face for 5 to 6 minutes. Doing this opens up the pores and allows the nutrients in the gel to penetrate the skin. Apply the gel and let the skin absorb it completely. Finish by applying a moisturizer, if needed. You can apply the gel twice a day. Alternatively, you can use it every night before going to bed, which will give it more time to repair and rejuvenate your skin. This homemade anti-acne gel will stay good for 10 to 15 days when stored in a cool, dark place. Keep your face clean by washing it twice a day. This keeps impurities from developing into acne. Use noncomedogenic facial products. 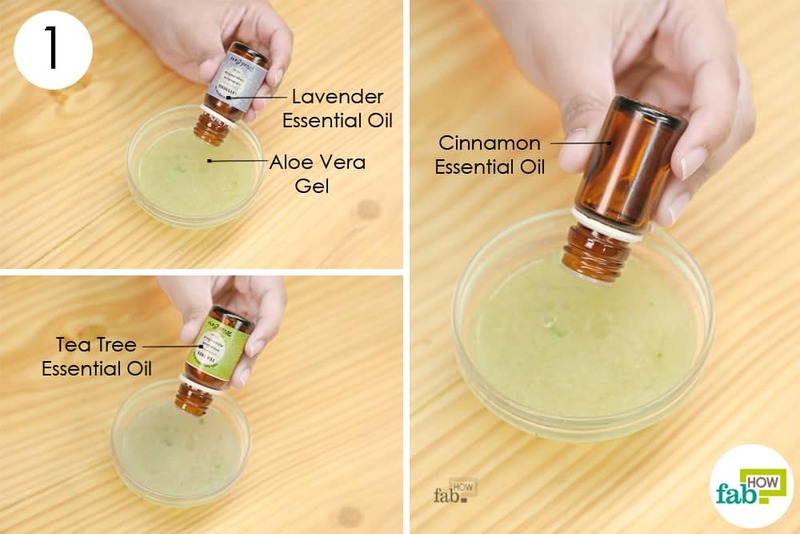 You can also opt for homemade serums for acne-prone skin. 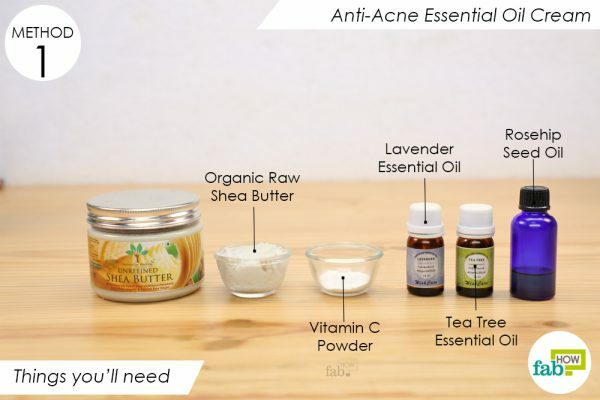 Ther are several DIY face masks to improve acne-prone skin. 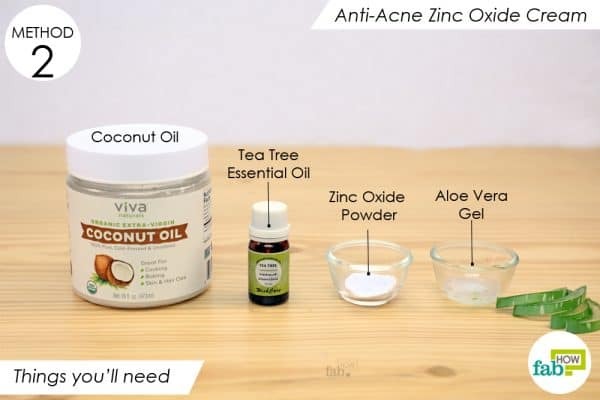 You can also use baking soda to fight acne in different ways. If you find baking soda too harsh for your sensitive skin, use honey as an effective treatment for acne or oatmeal face masks for acne. Maintaining a skin care routine that includes cleansing and moisturizing every night before going to bed will give your skin a healthy look. Exercising every day and drinking lots of water ensures drainage of toxins from the body, which helps to prevent acne. Eat complex carbs, fruits, and green leafy vegetables. Do not use makeup and other cosmetic products that are abrasive or harmful for your skin. Never go to bed without cleansing your skin. 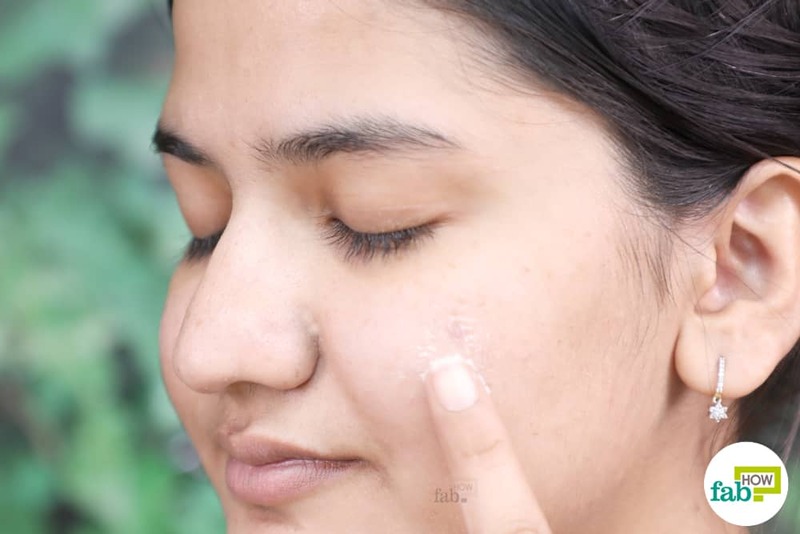 If you find your skin sensitive to over the counter products, you can always opt for chemical-free homemade makeup removers. Avoid squeezing or popping pimples or blackheads. Though you may think you are helping by removing the debris inside the pore, you are causing the bacteria to spread to areas that aren't currently infected. Thus doubling your chance of producing a new breakout. Sayorwan W, Siripornpanich V, Piriyapunyaporn T, Hongratanaworakit T, Kotchabhakdi N, Ruangrungsi N. The effects of lavender oil inhalation on emotional states, autonomic nervous system, and brain electrical activity. Journal of Medical Association of Thailand. https://www.ncbi.nlm.nih.gov/pubmed/22612017. Published April 2012.